The holiday party gale is swiftly taking over and it’s time to get your floor-grazing gowns, vertiginous heels and tailored jackets ready. Begin by refreshing your wardrobe of blings with a playful metallic dress and add power to the look with a touch of shimmering accessories. Contrast is the key here and also the line between classy and OTT. To keep it understated yet happening, go less on drama and high on silhouettes and designs…deep necklines call for bare necks, ergo swap the chokers and pendants with thin bracelets or a headband. Stockpile on this style and give your celebrations a poised start. 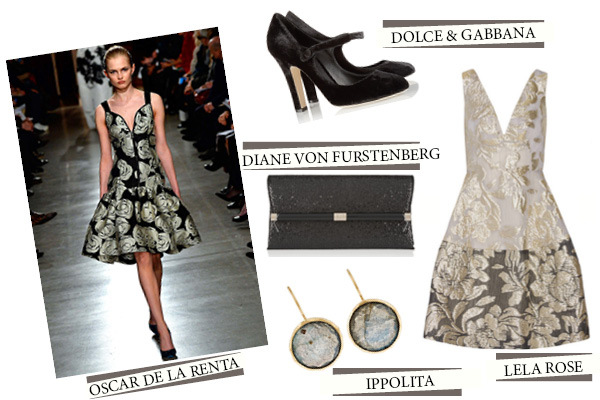 Find the products here: Diane Von Furstenberg; Dolce and Gabbana; Lela Rose; Ippolita.